As mentioned in prior posts, imports and exports are significantly influencing U.S. producer milk prices. The most recent data suggests a deepening problem as the U.S. milk prices are influenced by international factors. Cheese will be examined first as it is always the most import commodity influencing the Class III milk price. 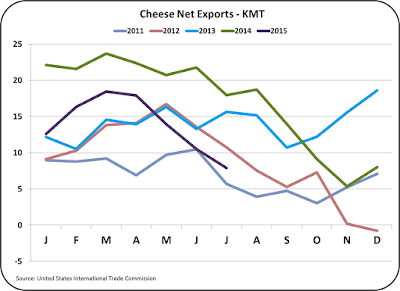 As shown in the chart below, cheese net exports have fallen to the levels of five years ago. 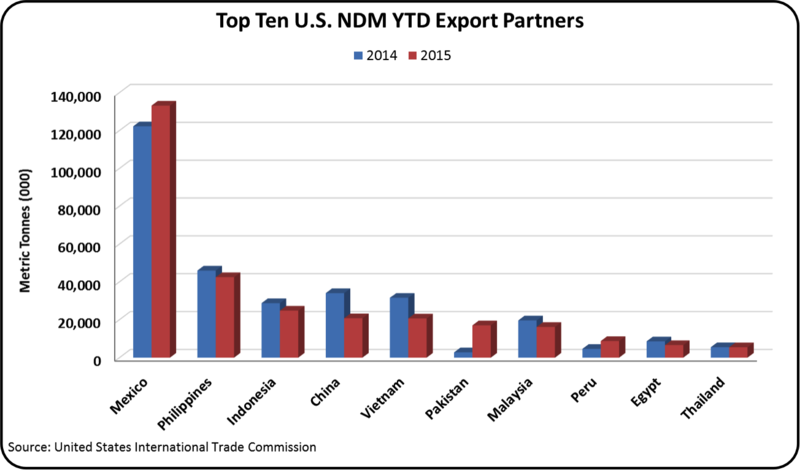 These net exports are less than half of the 2014 net exports. This is having an influence on inventory levels. 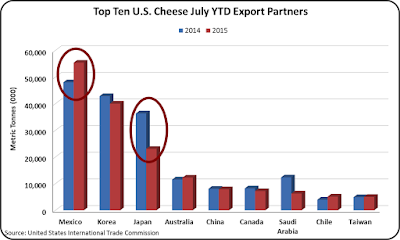 The data behind the chart above shows that the issue is related to both exports and imports of cheese. Exports will be examined first, but the data on imports is equally important. 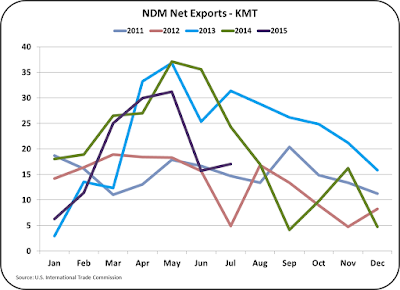 Exports have fallen from highs in excess of 35,000 metric tons to 25,000 metric tons in July 2015. Sales were down for all three major importing countries (Mexico, South Korea, and Japan) in July. 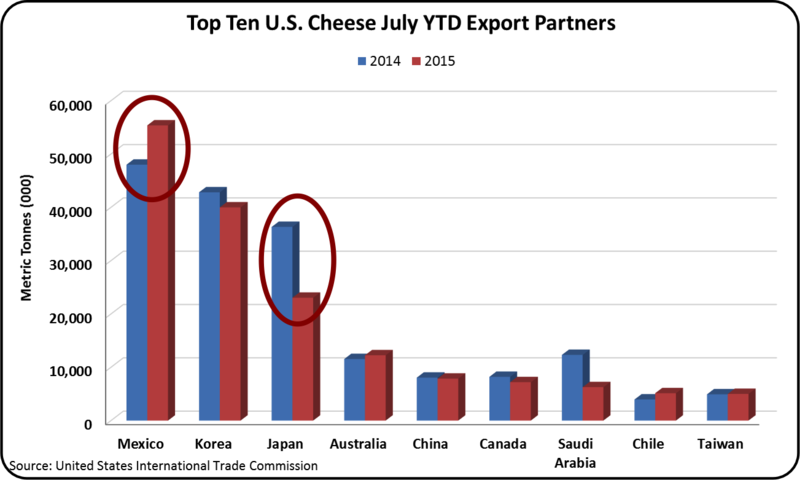 YTD cheese exports to Mexico are up, but cannot make up for the volume losses to Japan. 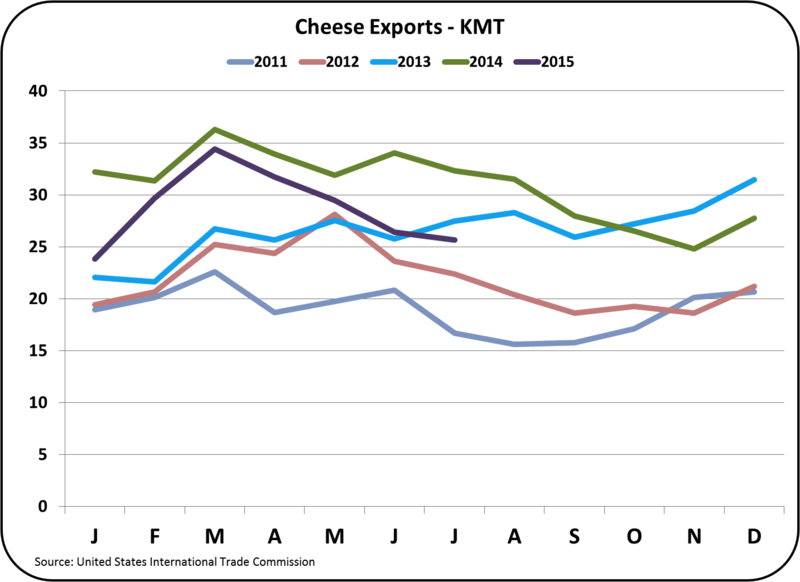 Increased exports of cheese to Mexico have kept cheese exports reasonably healthy, but the losses in exports to other countries is overwhelming YTD gains in Mexico. There is also a very significant change in cheese imports. 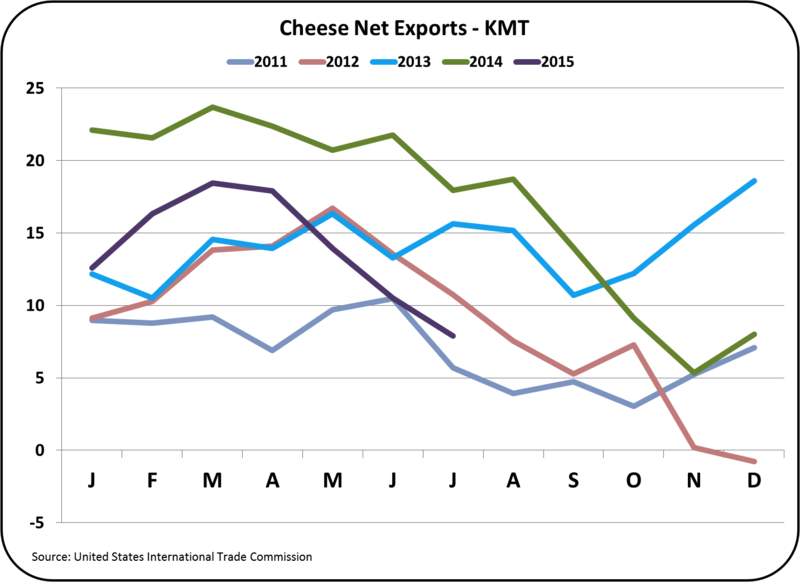 Cheese imports are at record highs with a good possibility of new record highs in future months. 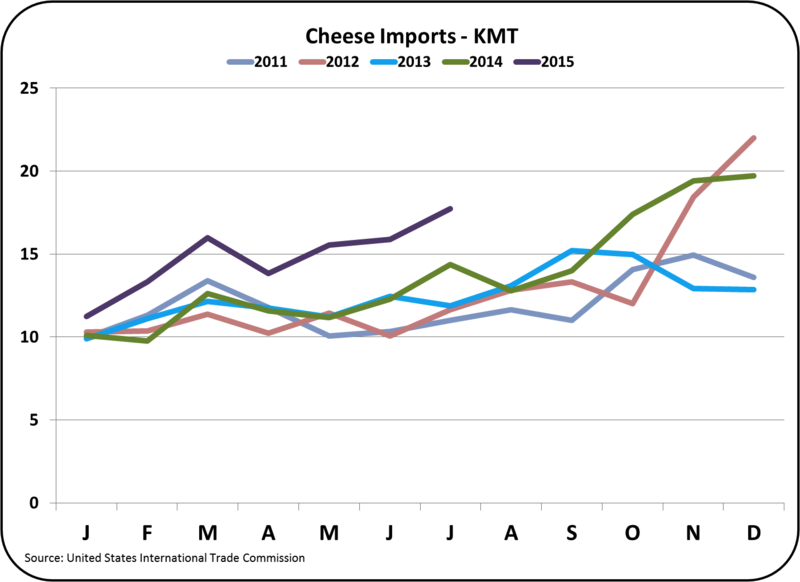 In the past, imports of cheese were limited primarily to specialty cheeses typically imported at the end of the year holiday season. This is changing. 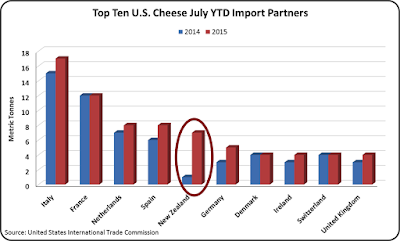 As mentioned in the prior post, the most major change came from imports of cheddar and other cheeses from New Zealand. 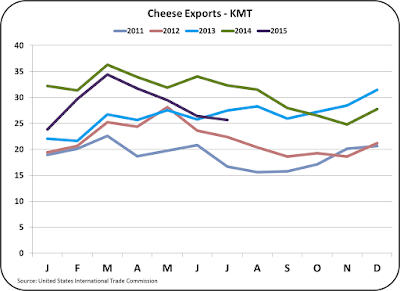 Little cheese has been purchased from New Zealand in the past, so this could signal a lasting change in a transition from a domestic cheese market to an international cheese market. 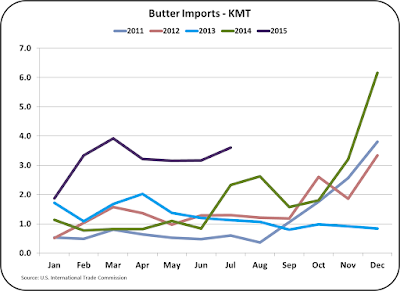 Butter has maintained prices high and inventories at reasonable levels. Based on the data below, it is doubtful that this will continue. 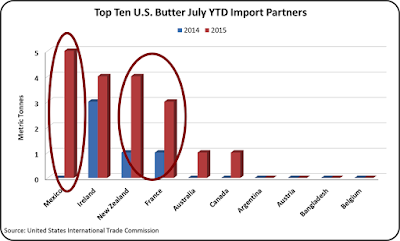 The U.S. has become a net butter importer as exports have dropped and imports are rising. 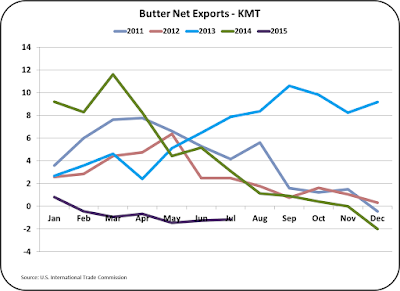 As mentioned in prior posts, butter exports have fallen drastically from the 2013/14 levels to the very low level of exports in 2015 as shown in the chart below. 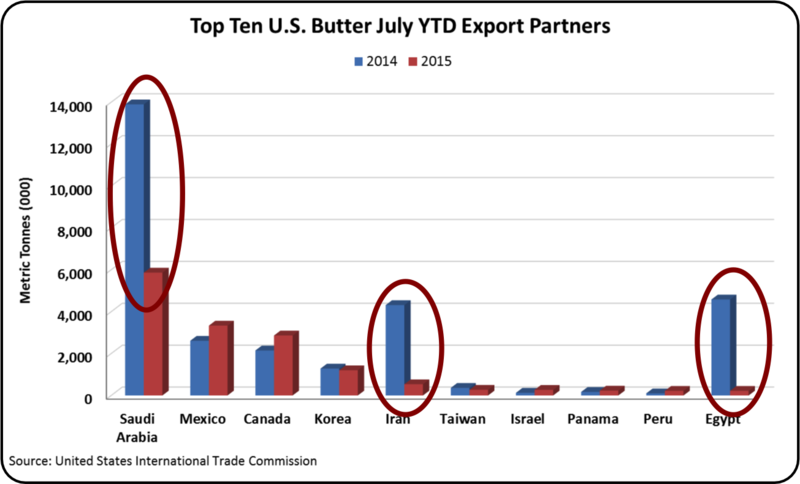 The high levels of butter exports in 2014 to the Middle East, have largely disappeared. 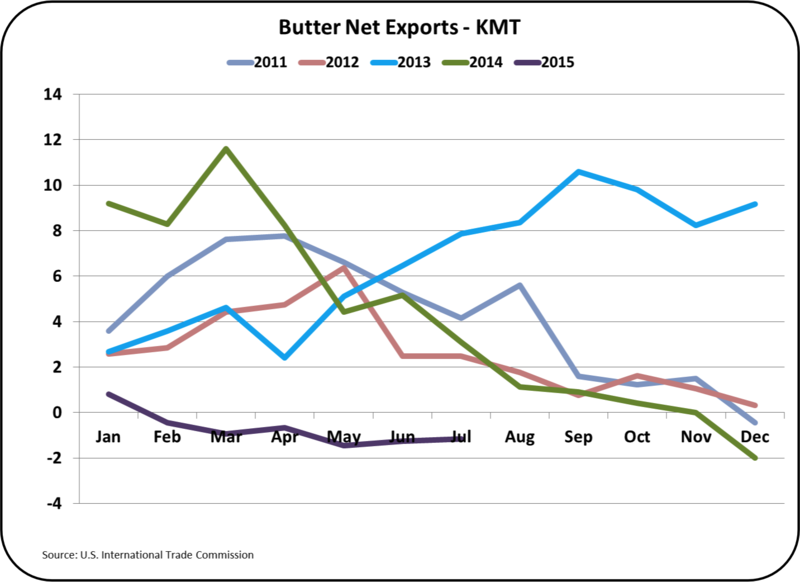 No improvement in butter exports is expected for the balance of 2015. Butter imports are the real news. 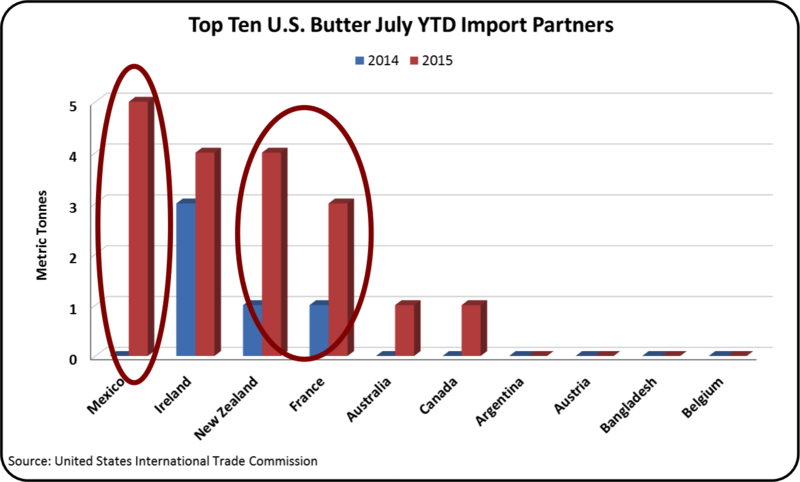 Like cheese, butter imports are at record levels. 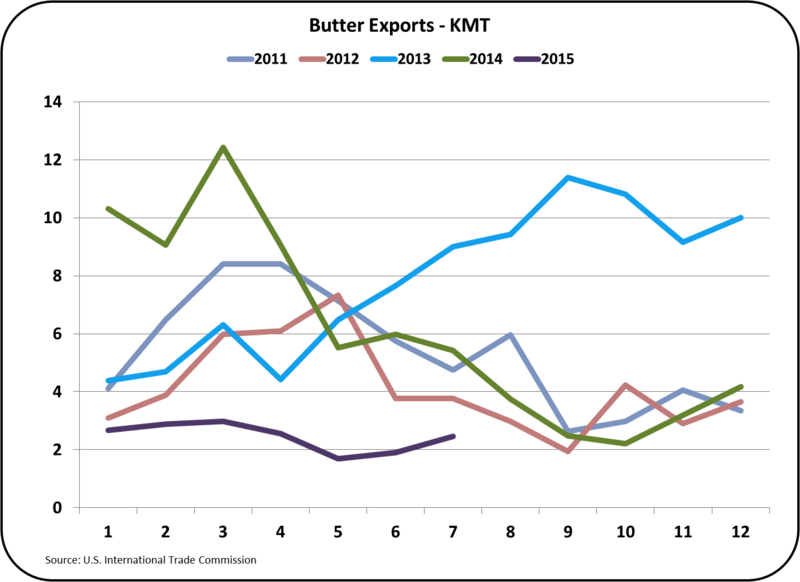 The U.S. domestic market has continued to maintain high butter pricing as covered in the prior post to this blog. 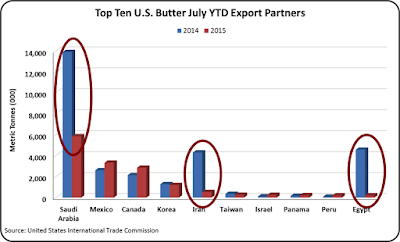 With significantly lower international prices, it is probable that U.S. butter prices will soon fall. 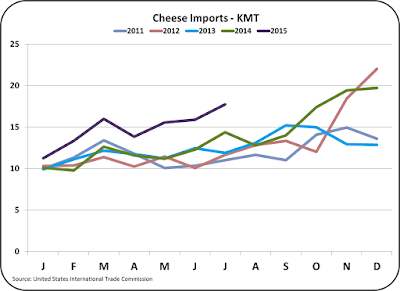 In the August 27, 2015 post to this blog, the increased level of imports from New Zealand and France were reviewed. The increased level of imports from Mexico is even more significant. 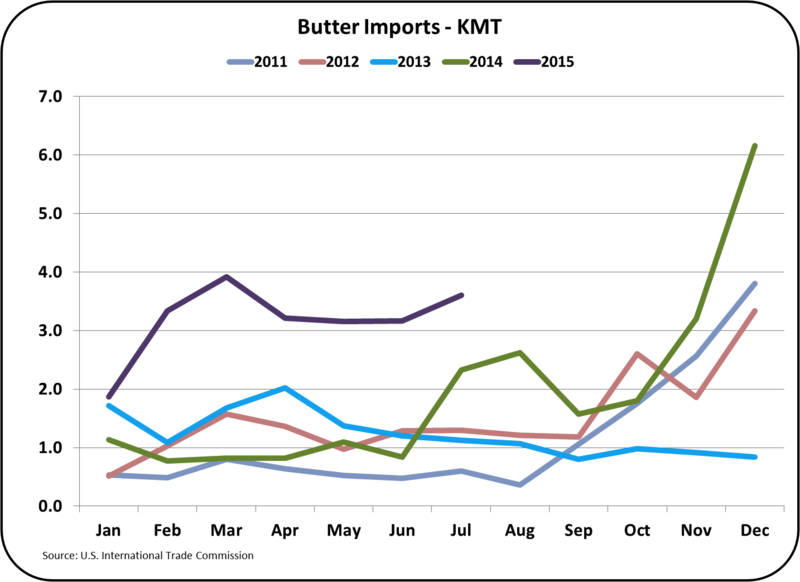 With the reduction in restrictions on imports and exports under the NAFTA agreement, imports of butter from Mexico are available. Pricing determines the amount purchased. 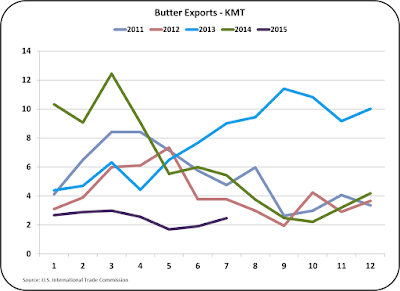 The currently high U.S. butter prices are destined to fall as international factors come to play. As mentioned in prior posts, a falling butter price will have little influence on the Class III milk price, but will increase milk protein value and decrease butterfat value. Nonfat Dry Milk (NDM) is the basis of Class IV skim milk pricing. 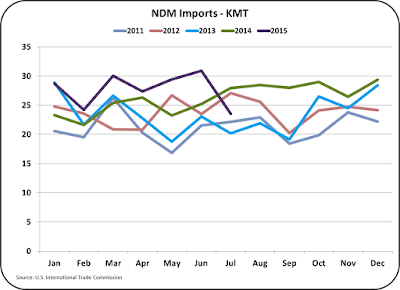 Imports and exports of NDM also are under pressure. 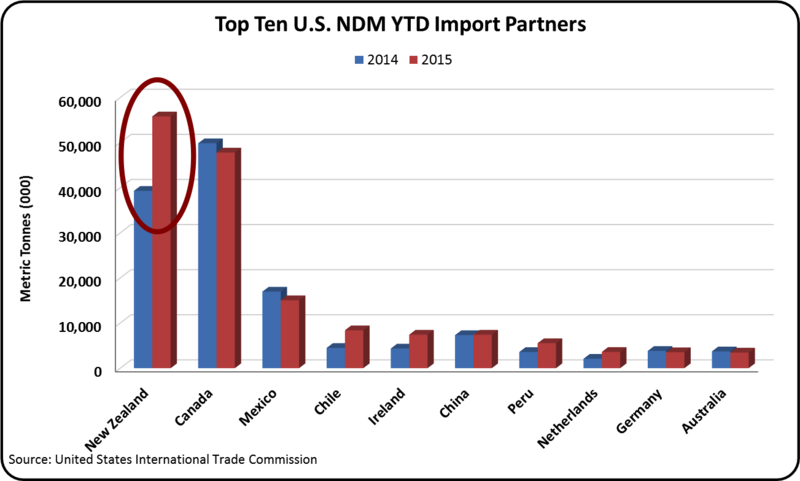 The U.S.'s largest dairy export item is NDM. 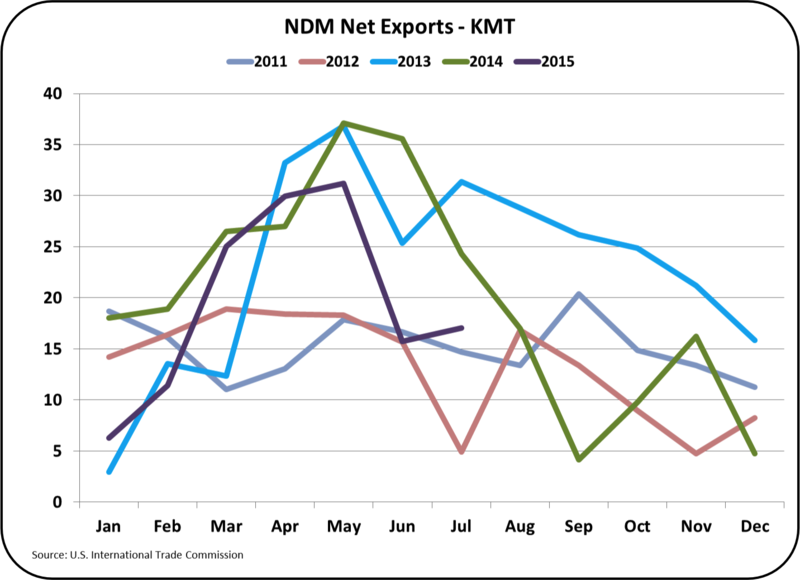 In July, exports of NDM were down 13% from the prior year and imports were up. Most of the NDM is going to Mexico and much of that is supplied from California. Sales to countries in the Asia/Pacific region are now saturated with low cost product from Europe and New Zealand. Imports of NDM are at record levels as shown below. However, these record levels are nowhere near the record levels for cheese and butter. 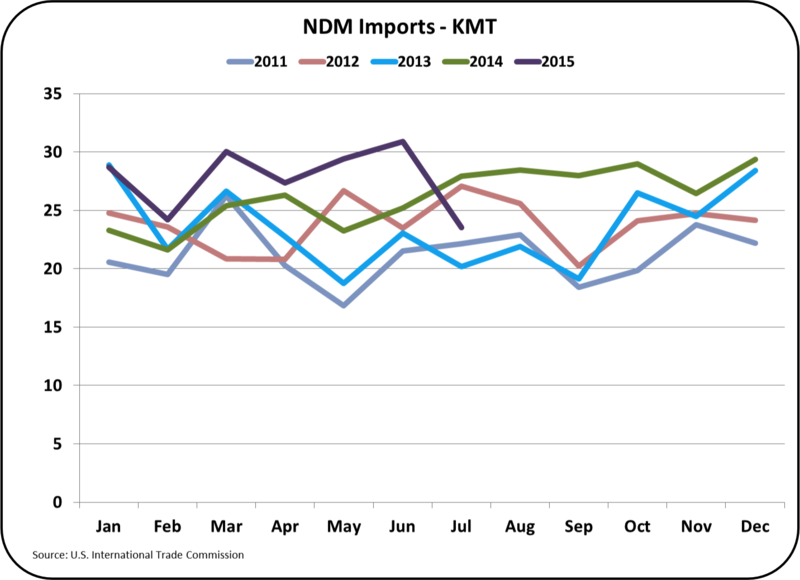 Most of the increased NDM imports for 2015 have come from New Zealand. NDM is used by cheese makers to reach protein levels needed for efficient cheese making and by prepared product manufacturers that need a dry source of dairy. The one consistency in all of the above charts is that exports are down and imports are at historical highs. Dairy is now an international business where commodities are openly traded. Dairy trade between Mexico and the U.S. under NAFTA is flourishing. This is probably a sign of the future as new trade agreements with other countries are being implemented. The U.S. dairy business must structure itself to cope with this change. Local markets and small dairies have evolved into national markets and large dairies. Now these markets are becoming international. Low production costs and financial sophistication are required to effectively compete in the international markets.